Criss cross ribbon Christmas trees are not only beautiful, but very elegant. The ribbon adds design, texture, and color to any tree, regardless of the theme. The criss-crossed ribbon creates a very full and densely decorated appearance for a lavish, designer look. This idea works well with both expensive and inexpensive trees. The look works wonders on cheaper trees with a low tip count since the eyes are drawn to the decorations and ribbon, so the bare spots in the tree are not as noticeable. 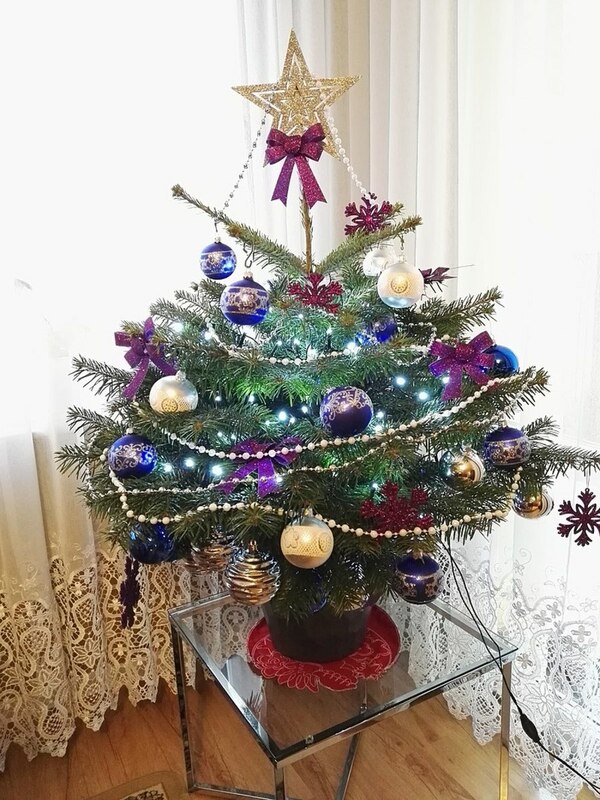 Since this technique is fairly new, it offers a unique approach for any decorator looking to create a beautiful and elegant looking tree. You can use any color, style, or patterned ribbon as long as it is wired ribbon. I would suggest that you use ribbon that is 2-3 inches wide because it is easier to work with and it won't look like you went overboard. 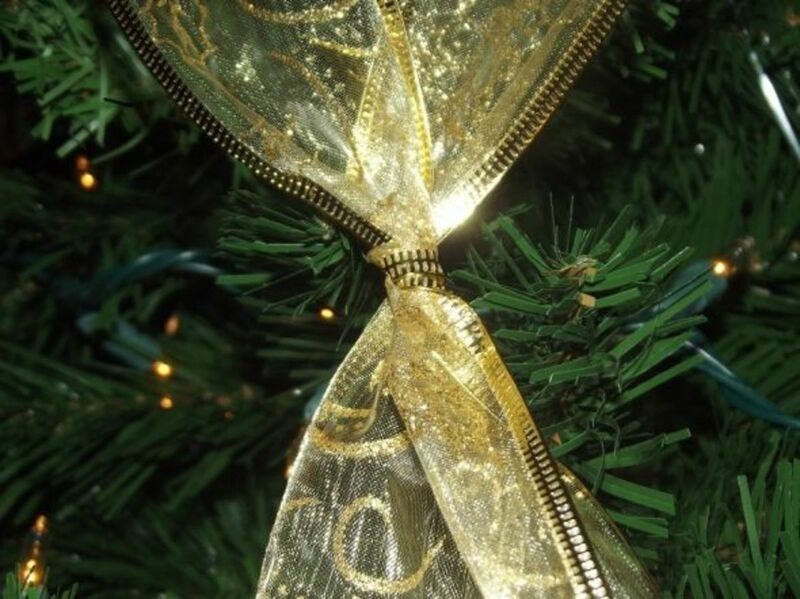 Depending on the size of your tree, you will need 6 to 8 pieces of ribbon cut about twice the length of your tree. 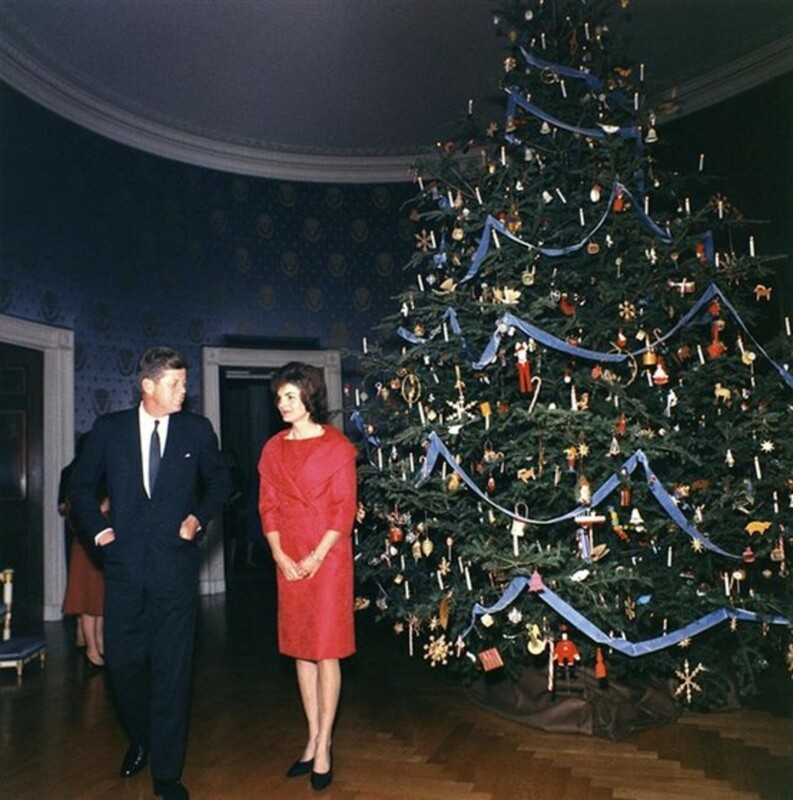 For example, if you have a 6 foot tree, you will want to cut 6 pieces of ribbon 12 feet long. If you have a slender tree, then 6 pieces will be plenty. If you have a very big Christmas tree that is very full and wide, you will want to do 8 pieces. Extremely large trees over 8 feet high and 3 feet wide will probably need 10 to 12 pieces of ribbon. If you don't get it right at first, don't worry. You can easily add or take away ribbon as needed when you get to the first step. 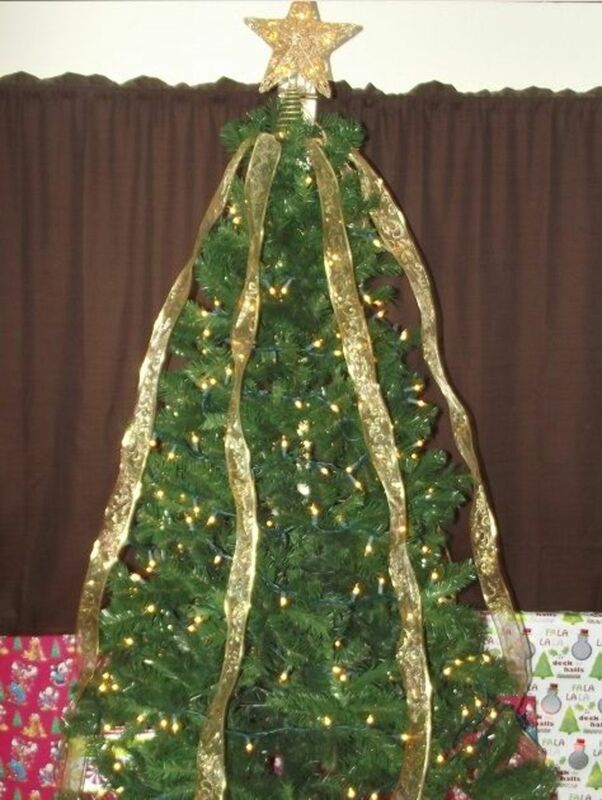 How Much Ribbon Do You Need for Your Tree? My tree is always a specific theme or color scheme. Somewhat of a theme but I always put the special ornaments on whether they match or not. I don't decorate a tree. Secure the ribbon pieces at one end. After cutting the ribbon into individual lengths, gather them and make sure that any patterns or designs are all going in the same direction. Once you have them in order, secure them using a rubber band, bread tie, or other method to keep them held together tightly. Leave 2 to 3 inches so that you can secure it to the tree. Drape the ribbons over the tree evenly. After securing the ends of the ribbon, it's time to drape them over the tree. Place the secured end on top of the tree and drape the ribbons evenly around it. 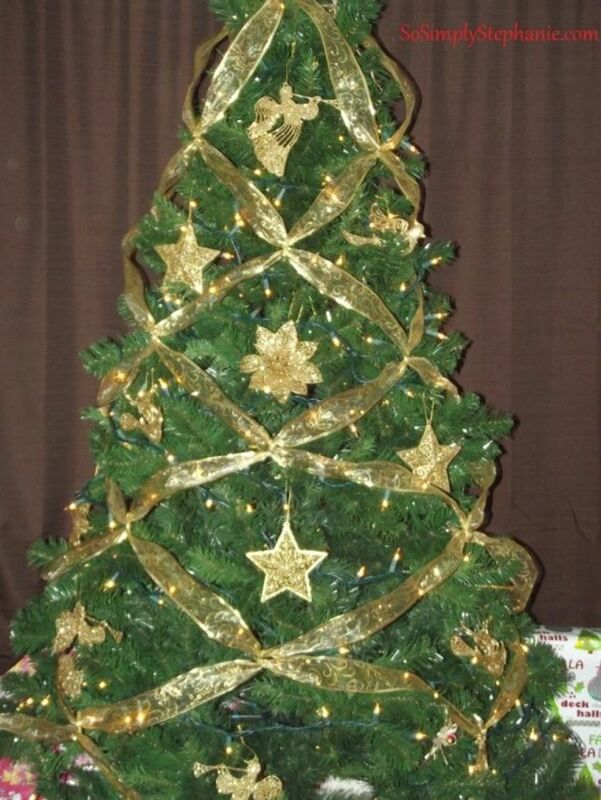 Pull your ribbons straight and then secure the top to the tree by pinning, using wire or tucking it under the topper. I have a star topper that fits snugly on the tip of the tree so I hide the end of my ribbons under the base of the topper. The first row of sections will look weird....don't worry! It's normal. Now that you have the ribbons evenly distributed around the tree, it's time to make the first criss cross. Starting anywhere on the tree, select two ribbons that are next to each other and cross them. You want to make your cross about 12 inches from the top of the tree. Once you have criss-crossed the ribbon on the first row, it will look weird. Don't worry — it will all come together shortly. It's normal for it to look too close together at the top and too wide between the sections. Just make sure your sections are even around the tree. If not, adjust and straighten them accordingly. Each section will be a guide for keeping your sections straight on each row. Your twists should look something like this on each section of your criss-crossed ribbon Christmas tree. On the second row, you will criss cross ribbons again but with different ribbons. Start with a section and cross the left ribbon with the first ribbon of the section to the left, and the right ribbon with the first ribbon in the right section. Criss cross the ribbons with their new mates and continue until the row is finished. Again, all the ribbons should be matched up on this row and there should not be any leftover ribbons that are not criss-crossed on any row. Once you have completed the second row, continue on to the next until you make it to the bottom of the tree. The sections of each row should cross in between the sections of the previous row, creating a webbed pattern. Try to keep the sections straight. The sections in the first, third and fifth row should line up evenly, while the second, fourth and sixth line up evenly, but are off-centered in the odd rows. 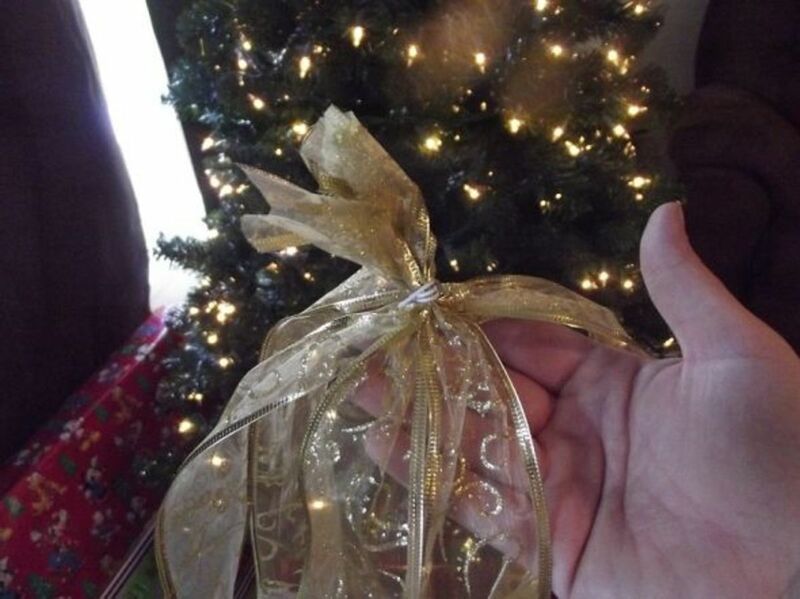 Once you have criss-crossed the ribbon to the bottom of your Christmas tree, you are almost finished. You can either cut the excess ribbon off and tuck the end into the tree or make a final criss cross between the sections, cut off the ends and tuck it neatly along the bottom branches to create a solid ring around the bottom of the tree. Work with the ends until you have it the way you like it. Once you have finished criss-crossing the ribbon on your Christmas tree, go back and adjust the sections, rows, and individual ribbons so that they are evenly lined up with ribbons nice and straight so that your tree has an overall nice and neat appearance. 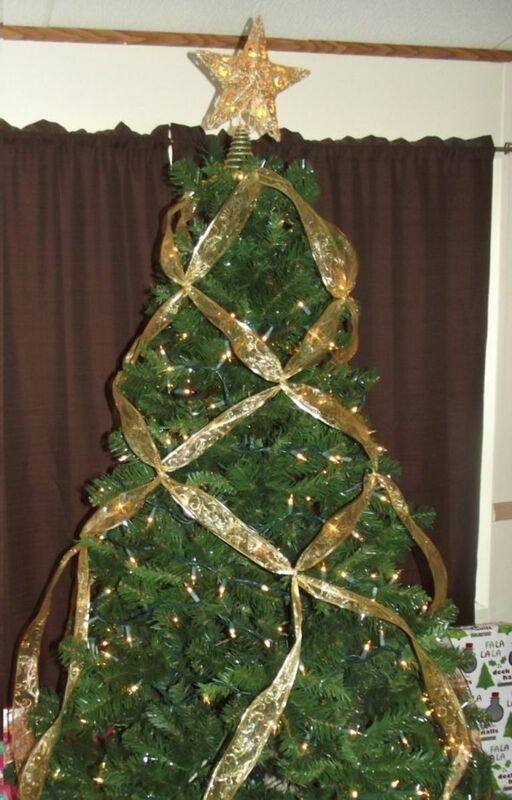 What Do You Think of the Criss Crossed Ribbon Christmas Tree? 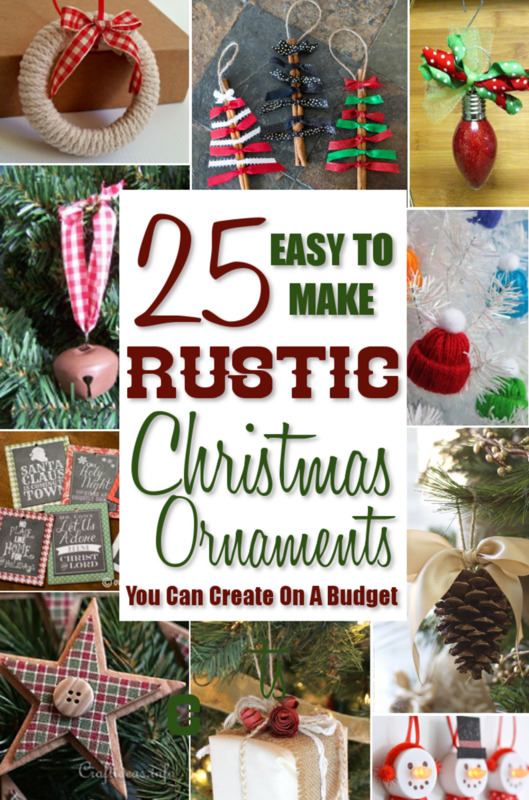 Share your thoughts, tips and ideas for decorating your own tree. I added clip on large ornaments at every twist and it looks amazing! I was tired of the same decorating. Thanks for the wonderful idea. Just saw picture and looks beautiful. Always have trouble with garland etc and takes forever. Anxious to try so many good suggestions to try with ribbon. Thank you. Have a Merry and Blessed Christmas! According to the guide, I tried 6 ribbons with a 6 ft of medium width; I had to stop on the second row, I was not liking it. It looked too sparse. I need 8 strands of ribbon. This is my second year following these directions and I love it just as much as last year! It's such a classy addition to our Christmas tree!! And each year can look completely different from the last depending on the ribbon you choose to use. Thank you so much!! I wish I could share a picture with you of our tree this year. Very well explained will try it for Christmas 2017. Have been using the same style for years and need the change. Thank you and have a Merry Christmas! I really like how sophisticated this makes your tree look! I'm going to try this this year! Thanks so much for the great directions and pictures. I love beautiful trees. I'm doing a country tree this year so not sure it will work but i'm doing this next year for sure! Love this idea. Plan to do it this year. Thanks for the instructions. Awesome, it looked great and I received so many compliments this year. The most memorable compliment was that my tree belonged in a magazine! Thanks for the tutorial, it was extremely helpful. Thanks for taking the time to post. I did it! Made my tree look beautiful! Merry Christmas! I love the way this looks! We have a huge tree (9ft tall & 5ft wide) so I was nervous that I only had 8 spools of ribbon that were each 14.5 long. So I spaced my rows a little farther apart and it worked perfectly! I even had room at the end to tie bows in the ribbon to finish the rows off! Thank you for the inspiration! I am hoping that my idea turns out "ok" took two different color ribbons (burgundy and gold) here is crossing my fingers!!! I did mine this year with garland I have and it turned out nicely might have to add two more strands next year. I criss crossed the ribbon on my tree last year and it was beautiful. This year I will use a different color theme. Thanks for sharing your ideas!! How did you make the bow for the top? My tree rotates, does this bow go over the tree top or sit in front? I just saw this beautiful tree done in Blue with Blue Poinsettias. Adored it. We always do a theme or color scheme. This year Living room in Blue, our kitchen is the the trafitional Red and Green and our bathroom in Pink and White. Last year was not a good Christmas. We were filled with sadness and depression. This year we feel better and want to decorate and celebrate our Lord and be happy and thankful. We are trying this tree. Enjoy your Christmas. And by all means Merry Christmas. This style of decorating the tree is so effective but simple enough especially if you have left your decorating until the last minute or need to decorate a tree quickly for a party or other event. This is so beautiful, festive and easy to do. 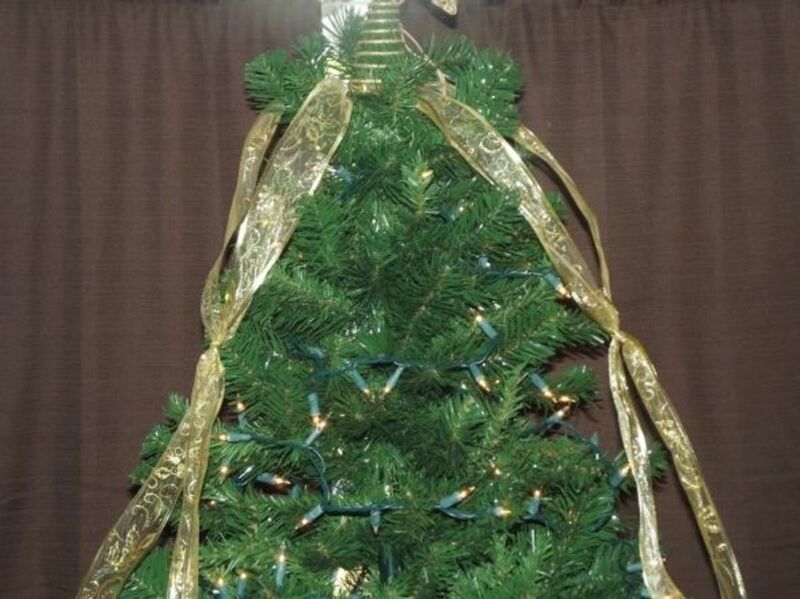 I would love to do this next year for my artificial tree, since I assume it would work on either a fake or real tree. Great pics to show how it's done, too. This looks really cute. It seems impractical for a large tree that we have in our living room, but I'm going to try it anyway. I like the look of ribbons on a tree. Looks gorgeous. Thanks for detailed instruction. You need more than one roll of ribbon. With Christmas nearly here it's time to start decorating the tree. 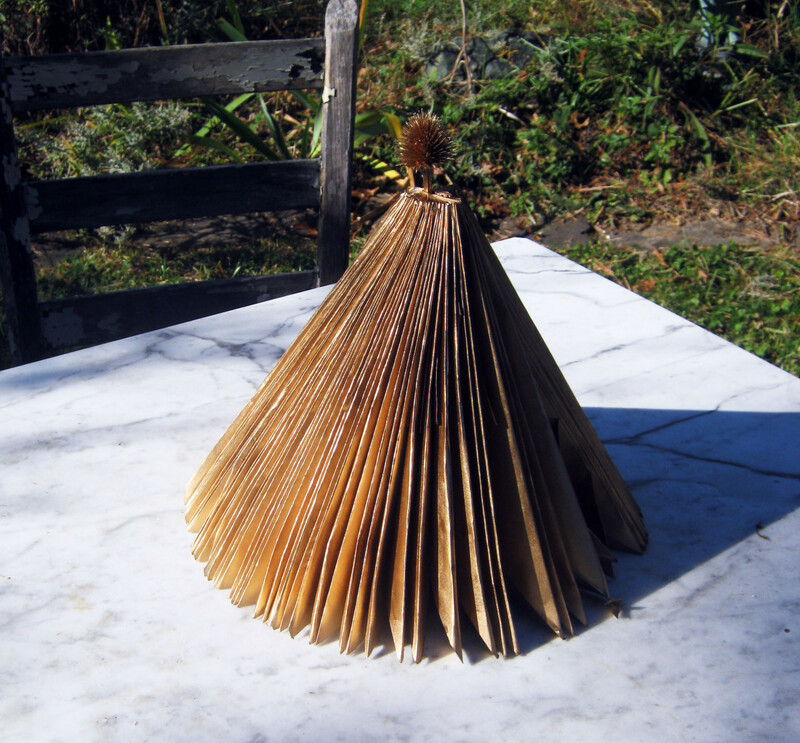 I came across your article, it's so beautiful and you have explained how to do it very well. Hope you have many more readers spreading this simple idea for decorating a tree all around the world. I will pin it on my board. Here's to a great Christmas and happy 2016 to you. The crisis cross tree was a great idea !!! I didvnot have a chance to buy a wired ribbon what should I do? LOL. The sad part is that it's true! I rmeember that year. I just don't rmeember which year it was exactly and why it happened.And for the record, our tree is not up either. Only going up next weekend because we don't have J the weekend after that or I'd wait until then. Too much work to keep kids from taking off ornaments! Thanks for the wonderful directions. Will be doing this on my tree today. Hope it looks as good as yours does. Merry Christmas. Beautiful cannot wait to try this on my tree this year!! I always wondered how to do this. Beautiful!! @Michey LM: Thank you Michey! You and yours, too! I've never seen ribbon done this way on a tree before. I'd love to give it a try! That makes a gorgeous tree! Thanks so much for the instructions. Blessed. Great idea, it looks lovely. Thanks for sharing. 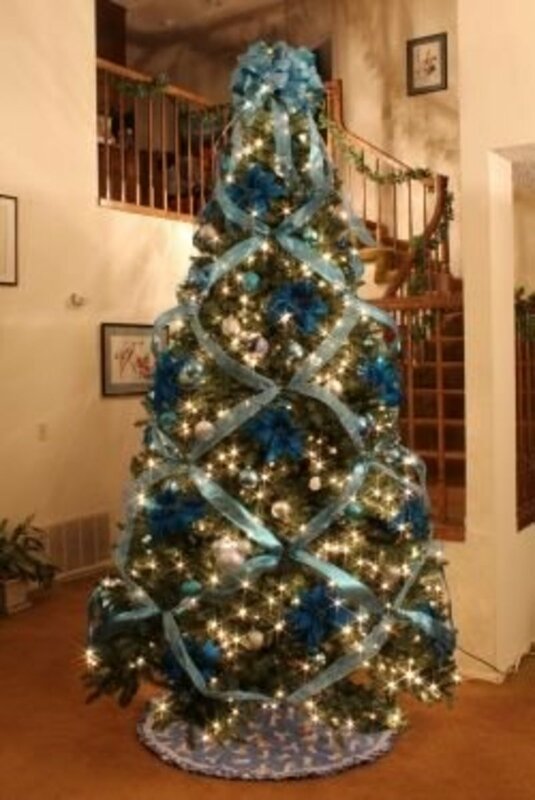 Very elegant way of decorating xmas trees with Criss Crossed Ribbon. this is a wonderful creative idea. thanks for sharing with us. great lens! Thanks for sharing your knowledge. It is always good to learn something new. Make it a creative day! Thank you so very much. I had seen this and wanted to it this year. This was just what I needed. Mine turned out wonderful because of you sharing...Yhanks again! Merry Christmas!